Bochner’s Realistic Self-Defense Training and Fitness Center is located in Cranston, Rhode Island. Our jiu-jitsu based system specializes in realistic self-defense, fitness, and self protection for adults and children ages 5 years and older. The instruction at our school is conducted in a friendly, non-threatening atmosphere while focusing on teaching the most effective concepts and techniques that you, the student, will need to defend yourself. Students who train at the academy learn self-defense concepts such as being aware of your surroundings, trusting your intuition, how to verbally defuse an escalating situation, and how to avoid becoming a victim. The physical aspect of our jiu-jitsu based art includes teaching the student how to effectively strike an adversary, ground survival techniques, defenses from common choking, grabbing, and punching attacks as well as from an armed adversary. Scenarios are used to add an element of realism to your training program. Bochner’s Realistic Self-Defense is designed for individuals who want to learn to defend themselves and their families. Bochner’s Realistic Self-Defense Training Method is based on Marc Bochner’s twenty three years of martial arts training and was created by combining elements of different martial art systems into one effective and realistic form of self-defense. Unique blend of martial arts into one realistic form of self-defense – that is constantly evolving. 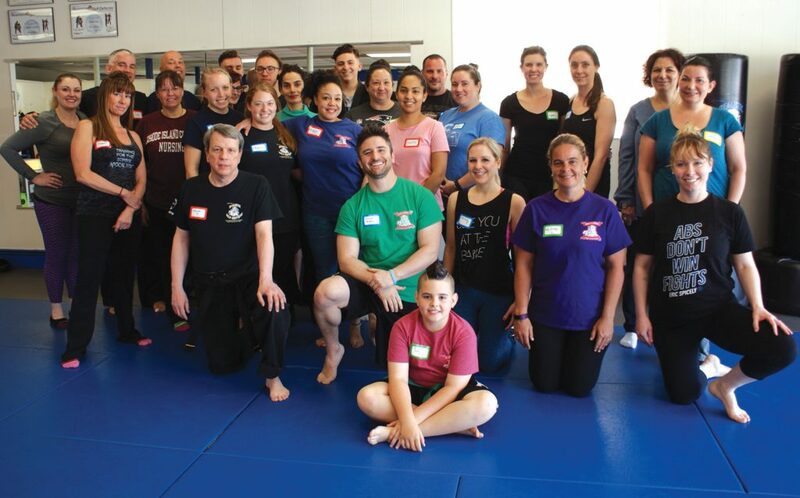 Fitness for self-defense that combines elements of the martial arts, physical therapy, and personal training experiences to help all individuals lose weight and increase fitness levels. Classes for men, women, and children. Private lessons, and group fitness classes are available. Adults can relieve stress after work and be excited about getting in better shape and learning to protect themselves and their families. Children will learn our blend of realistic self-defense while increasing their discipline, focus, goal setting and respect. Marc Bochner has 20 years of martial arts experience, 12 years of teaching experience, Doctor of Physical Therapy (URI 2009), author of 3 published self-defense books, published in Black Belt Magazine, instructor of the official Bochner Realistic Self-Defense’s DVD’s. How do you know if our center is right for you? The best way to know if our academy is right for you is to purchase our risk free new student trial. This trial will include unlimited classes for four weeks, a uniform, and a BRSD T-shirt. After the 4 weeks of training if you were not satisfied with your training we will refund your money. Although our students are proficient in striking, grappling, and self-defense, our style is not designed for MMA competitions or sport grappling. Bochner’s Realistic Self-Defense Training Method is designed to teach individuals and law enforcement personnel to defend themselves and their families when their lives or the life of a loved one is in danger.